In the Jazz Ensemble at Archbishop Curley High School in Baltimore, nobody “tries.” Longtime music teacher David Stauffer expects his students to do far more than that. “An excuse for failure,” the young musicians replied in unison, with knowing laughter. High standards and superior musicianship are the norm at Curley. Under Stauffer’s leadership for more than three decades, jazz band members develop discipline and a lifelong love of the art while mastering difficult repertoire. That commitment will be on display March 7, when the school’s cafeteria will be transformed into a nightclub for “All That Curley Jazz.” The centerpiece of the jazz program at the all-boys high school, the annual concert will feature student performances as well as selections from Curley alumni who are now professional musicians. Again, achievement, rather than effort, is the goal. The band fosters relationships beyond music. 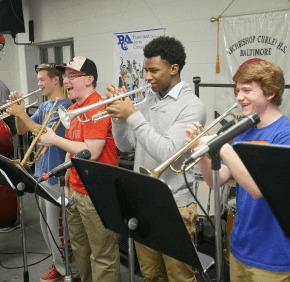 Stauffer has a hard time keeping track of the Curley grads who have studied music in college or played professionally, and said the key to the jazz band’s legacy is treating music education not as an optional extracurricular, but as an essential part of life. “Instrumental music is a microcosm,” explained Stauffer. “All the parts of everything they do in their life are in music. It’s a must for me that we give them the kind of education that teaches them a sense of proportion and mathematics, that teaches them great literature. Junior saxophonist Emmanuel Adjaye, who first heard the jazz ensemble during an eighth-grade school tour, explained that being a part of the jazz ensemble requires students to do more than just read music. It extends to getting notes right, and understanding musical dynamics and theory. That laser focus on the small things, Adjaye says, is one of the reasons he loves rehearsal.